Andrew Christiansen, a war photographer turned cabdriver, is having a bad year. His mother has just died; his father, on the verge of a nervous breakdown, gets arrested; and he's married to a woman he doesn't love. To make matters worse, Sarah, the gifted actress from his past, storms back into his life, bringing with her a hurricane of changes and the possibility of happiness. Keeping Andrew sane is his beloved camera through which he captures the many Torontonians who ride in his taxi. Also keeping Andrew rational is his friendship with Zakhariye, a Somali-born magazine editor grieving the death of a son. Through Zakhariye we glimpse a world beyond Toronto, a world where civil wars rage and stark poverty delivers everyday sorrow and anguish. Something Remains probes the various ways humans grieve when the lives they build for themselves fall apart. It speaks of the joy we find in what remains and the hope that comes with life putting itself back together in ways we never imagined. It is often difficult for me to review a book right after I finish reading it. I need time to process it, allowing thoughts, feelings, impressions, and emotions to penetrate my consciousness. Is this a book that will stay with me for the long haul, or one I will forget just as soon as I close it? 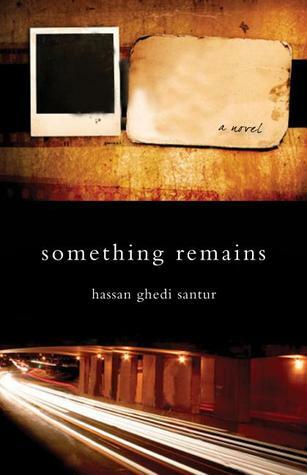 Something Remains, a debut novel by Somali-Canadian writer Hassan Ghedi Santur falls somewhere in between. This is a gentle, moving and immersive story that takes place in Toronto and shows the perspectives of a diverse group of characters as they cope with grief, loss, unhappy marriages, and the disconnect felt by immigrants struggling to find an identity in a racially and ethnically heterogeneous city. There is Andrew Christiansen, a former war photographer who now makes his living driving a cab and indulges his passion for photography by capturing brief glimpses of his passengers’ lives on film. Even though his wife, Rosemary, is a childhood friend and neighbor, their marriage is one of convenience rather than love. Andrew’s friend, Zakhariye, is a Somali refugee working as a magazine editor and grieving the accidental death of his only child. Andrew too is dealing with the pain and devastation in his family caused by his mother’s recent death. I know this all sounds really sad, but this is not a story that relies on intense drama or tragic situations to manipulate the reader’s emotions. Time is taken here to develop the main characters, showing their unique perspectives on events and allowing the reader to bond and empathize with them. Besides the sadness, there is also a feeling of hope as the characters carry on with their lives despite their burdens and gradually find joy again. While I felt the main characters, Andrew and Zakhariye, were sufficiently developed, I wish the female characters were treated with the same care. Now that several months have passed since I’ve read this book, I only remember their undesirable qualities. This is a lovely book, and even though many details are now fuzzy, I still remember how I felt while reading this on a long drive. I enjoyed spending time with these characters and visiting a city I hope to see in real life one of these days.